Roy Williams has been swearing more at his team recently. It's strange for the Southern sexagenarian to stray from his steady diet of "daggums" and "tough little nuts." But at this point in the season, the North Carolina coach knows his group needs a little extra motivation. He sees the potential in them, of course. After Monday's win over Notre Dame — an 83-66 victory that felt much closer but probably should have been bigger — the No. 14 Tar Heels (20-7, 9-5 ACC) are riding a four-game winning streak and have just three games left, all against unranked opponents, before finishing the season at No. 12 Duke. It's a relief, given the gauntlet this team has endured. Monday's win was the third in five days, the first time the Tar Heels have played that many ACC games in so few days since 1991. This year, they've had the third-most difficult schedule in the country and emerged with seven losses and five top-25 wins so far. Joel Berry joked that the team should play three games in five days more often, if only because of how well it's playing now. But that's hardly a joke, considering how this condensed schedule mimics that of the NCAA Tournament. And through the toughest stretch of the season, the defending champions have shown flashes of a team poised for tournament time. "We saw through this stretch how good we can be," Berry said. The senior point guard led all scorers with 21 points on Monday, and it was his layup with 2:05 left that capped off a 13-0 run to pull away from the Fighting Irish (15-11, 5-8 ACC). He also held Notre Dame's Matt Farrell — who averaged 21 points in his previous three games — to nine points on 3-of-18 shooting, including 1-of-12 from three. It wasn't the trademark bulldog defense that Berry always seems to save for the postseason. But it was close. "He gets up for games like this," Kenny Williams said. "I kind of expected that from Joel." The entire team adopted Berry's defensive focus to start Monday's game. The Tar Heels aggressively hedged nearly every Notre Dame screen early in the first half, denying the Irish's pick-and-roll opportunities and easy three-point chances. They still got looks, but they missed their first six attempts from deep, influenced in large part by a swarming UNC defense that threw a hand in almost every shooter's face. That intensity relaxed as the half went on, though, as Notre Dame hit six of its next 10 three-point attempts — including five makes in as many attempts from reserve forward John Mooney — to enter halftime down four. The Tar Heels' defensive deficiencies were showing yet again. That's when the profanity started. "Nobody could see what I said at halftime," Roy Williams said. "I was not pleased at halftime." The North Carolina coach issued his team an edict in the midst of its recent three-game losing streak: improve defensively or accept the mounting defeats. He stresses to his players that he's never had a team win a championship without playing defense. And for much of this year, these Tar Heels haven't done that. At times, Williams has called this the worst defensive team he's ever coached. At halftime on Monday, he called them much worse. "I've been here four years now; I think I've heard pretty much everything in the book," Berry said. "But honestly, that's how you have to get sometimes." Berry's reached the championship game in two of those years — a loss to Villanova in 2015-16 and last year's win over Gonzaga. Those UNC teams could certainly score, led by Brice Johnson and Justin Jackson and Berry himself. But they also played suffocating defense in the final stretches of games, like a snake choking out its prey after hours of resistance. 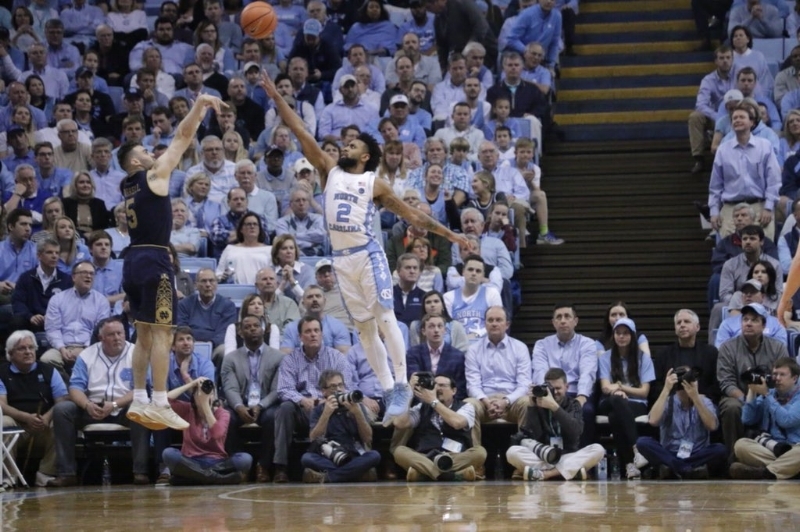 Two years ago, it was against Notre Dame that the Tar Heels flashed their defensive potential to the rest of the nation, allowing 47 points in a 31-point ACC Tournament win. It was built around the same type of action that Williams is implementing now: mixing up looks, trapping opposing ball-handlers and generally creating havoc. No, this wasn't the same caliber of defensive performance. It wasn't the same Notre Dame team, either, this one sorely missing ACC Preseason Player of the Year Bonzie Colson to injury. But the Tar Heels responded to their coach's challenge, holding the Irish to 37.9 percent from the field and just three points in the final 5:47 of Monday's win. "If we can do that," Berry said, "the offensive end will take care of itself." He's right. After a career night on Saturday, Luke Maye scored just eight points on Monday — but when he's on, he's as good as anyone in the country. Berry's fifth gear is Most Outstanding Player, and he can turn it on in an instant. And Theo Pinson, who scored 16 points and led UNC in rebounds (10) and assists (five) on Monday, might be the most overqualified role player in college basketball. And that's to say nothing of Kenny Williams and Cam Johnson, who combined for 27 points and four threes against the Irish. "When those guys are hitting shots," Berry said, "it's hard to guard us." The Tar Heels are rebounding at an elite level, too, as past championship teams always have under Roy Williams. Entering Monday's game, North Carolina led the nation in rebounds per game and rebounding margin. Against Notre Dame, UNC grabbed 42 rebounds to the Irish's 29 — and that's with the much ballyhooed "small lineup" this team has rolled out since early January. Roy Williams said his players were tired Monday after two wins in the previous four days, but they didn't show it. Kenny Williams said the players have been icing in cold tubs every day to offset the heavy toll on their bodies. Lots of stretching, lots of soft tissue massages — it's the same regimen this team knows from the NCAA Tournament. Even the strength and conditioning team is in postseason form. "It takes a little bit of toughness to win three games in five days," Kenny Williams said. They'll need that in March, when the Tar Heels might have to leave the state in the opening weekend. The resume is impressive: they've beaten three top-12 teams thus far, and two of their seven losses came to the two top-ranked teams in the country, neither at home. But a three-game losing streak to close out January sent UNC tumbling down the conference standings, and they'd be hard-pressed to leapfrog Virginia or Clemson for premium regional seeding in the NCAA Tournament. Still, they're undefeated in February and look the part of a surging tournament team. They're thriving on defensive pressure, threading no-look passes through zone looks, throwing down two-handed dunks... It sounds an awful lot like the North Carolina teams of the past two years. "We're not trying to go out there and be flashy; it's just what happens," Kenny Williams said. "I think we're getting our swagger back." No matter what their coach says — or maybe because of it — these Tar Heels are primed for a postseason run. This year's UNC men's basketball team is flashing championship potential after beating Duke in the ACC Tournament semifinals. Kenny Williams made the most of his NCAA Tournament return, leading UNC men's basketball to a win over Lipscomb.